Turn your iPhone®/iPod touch® into the ultimate mobile guitar-and-bass multi-FX processor and DAW recording studio with AmpliTube. The new Studio feature* (available via in-app purchase) lets you record and edit audio like in a computer DAW. Create killer drum tracks easily with the built-in Loop Drummer. 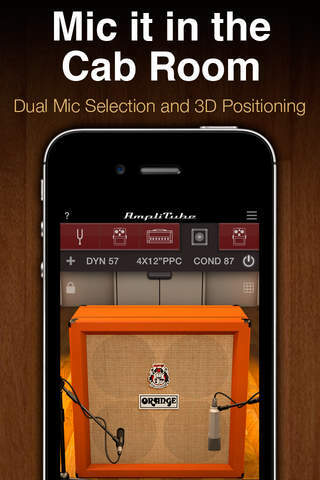 AmpliTube is Audiobus compatible; use it with compatible audio apps in any Audiobus slot. Use IK’s new, high-definition iRig® HD digital instrument interface, or the iRig® or iRig® STOMP, to connect your guitar or bass to your iOS device; and use iRig® MIDI to connect a floor controller. Play, practice and record anytime and everywhere with gear from the leader in analog gear-modeling. AmpliTube puts a full rig at your fingertips with 3 effects, an amp-head, cabinet and mic. Choose from 11 built-in stomps (distortion stomp available once registered), 5 amps (clean, crunch, lead, metal, bass) with full controls, 5 cabs and 2 mics. Expand your rig à la carte with effects like the T-Rex Moller and Big Pig, amps like the Soldano® SLO-100 and Ampeg® B-15R, and gear from AmpliTube Fender™, AmpliTube Slash, AmpliTube Jimi Hendrix™ and VocaLive (5 effects), via in-app purchase. 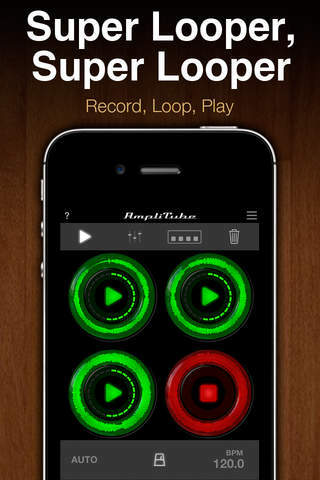 Loop Drummer syncs to the recorder and the Studio section. Get more loops via in-app purchase of Style Packs. Loop Drummer intelligently creates drum tracks — or you can build your own by dragging and dropping loops in the Timeline. Expand recorder to 4 tracks via in-app purchase. The new AutoFreeze lets you use separate FX rigs on each track. Add the new Studio section (via in-app purchase), and record and edit in a familiar & fully featured DAW environment. Record and produce directly in AmpliTube. Share high-quality audio files or M4As via FTP and SoundCloud. Includes Speed Trainer, Metronome & Tuner. If you have any problems with installation or in-app purchase, found bugs, questions, comments about this application, you can visit the official website of IK Multimedia IK Multimedia US, LLC at http://www.ikmultimedia.com/products/amplitubeiphone/. 10 new officially licensed models!